Air pollution in Pima County is clouding our future. It affects our quality of life in many ways. We can't escape it - we breathe it every day. Air pollution affects everyone. It is especially harmful to the very young and old, and those with lung diseases. This is a serious concern in Pima County because of our larger-than-average population of older people and individuals with existing respiratory problems. Laws are in place to protect our health from major air pollutants. Three pollutants have relatively high levels in Pima County: carbon monoxide, ozone, and particulate matter. Pima County has violated the health standards for all three of these pollutants in the past. Other pollutants of concern are nitrogen oxides and volatile organic compounds. These pollutants help produce ground-level ozone. An index of weekday pollution levels can be found in the weather section of the local newspapers. About 50% of the air pollution in Pima County comes from motor vehicle use. For every 1.1 miles you drive, one pound of air pollution, including greenhouse gas, is emitted into the air we breathe! The more miles we drive, the more air pollution we produce. The solution is clear - we must simply drive less. There are two places where ozone (O3) occurs in the air: the ozone layer in the upper atmosphere, and ozone at ground level. The ozone layer in the upper atmosphere protects us, like sunscreen, from the sun's harmful rays. The "hole" in this ozone layer, enlarged by human-made chemicals, is of great concern. Ozone that occurs at ground level is a pollutant. It is formed by the reaction of sunlight with emissions from vehicles we drive and products we use. Unfortunately, we can't pump this lower level ozone into the upper atmosphere to fill the "hole". Ozone levels peak regularly in the early afternoon and are higher during the summer. Irritates mucous membranes of the respiratory system causing shortness of breath, coughing, wheezing, chest pain, and headaches. Damages individual air sacs and airways in the lungs where oxygen and carbon dioxide are exchanged, reducing lung capacity over time. Particulate matter (PM) is a problem in the hot, dry climate of Tucson. PM consists of small particles, such as soot and dust, which can be visible to the naked eye or microscopic in size. It comes from motor vehicle emissions, earth-moving activities, tire and brake wear, dust from unpaved surfaces and other sources. Because of its small size, PM bypasses the body's filtering system and can be very harmful. Toxic and cancer-causing chemicals can be carried by particulate matter into the lungs. May cause breathing difficulties and respiratory pain. May cause irritations to the nose, throat, and ear canal which are often mistaken for allergic reactions. May clog the lungs and lymph nodes. May diminish lung function, especially in children. May weaken the immune system and lower resistance to infection. May increase the incidence and severity of acute bronchitis, pneumonia, asthma, emphysema and other severe lung illnesses. May cause heart attacks, stroke and premature death. Carbon monoxide (CO) is an odorless, colorless, poisonous gas emitted in motor vehicle exhaust and other combustion processes. It is more concentrated near busy roads and intersections. Carbon monoxide levels are higher in winter because of stagnant air conditions. Reduces oxygen levels reaching the brain, heart, and other tissues by obstructing the work of red blood cells. This may cause reduced alertness and decreased ability to perform basic tasks. May increase the risk of heart disease and cause chest pain in individuals with coronary heart disease. May promote the long-term development of arteriosclerosis (abnormal thickening and hardening of blood vessel walls). Many thanks to the late Michael D. Lebowitz, Ph.D. for his assistance with this text. 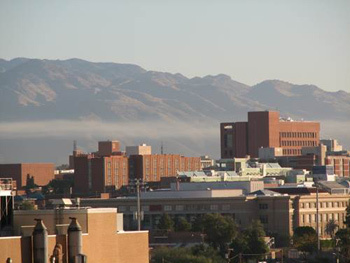 The Clean Air Program is supported by a grant from the Arizona Department of Environmental Quality. Air pollution is particularly harmful to young children and the elderly. Children are at risk because their lungs are not fully developed; they breathe faster, and they often spend lots of time outdoors. People with heart or lung disease, older adults and children are considered at greater risk from particulate matter especially when they are physically active. Ozone may affect outdoor exercisers by causing permanent damage to lung tissue and reduced resistance to infections. Exercisers should avoid congested streets and peak times for ozone (summer afternoons). Ozone is also harmful to those suffering from asthma, emphysema, chronic bronchitis, or previous lung infections. Smokers and those exposed to second-hand tobacco smoke are more susceptible to the harmful effects of air pollution. Use an alternative mode of transportation - walk there, bus there, bike, "net" there, or ride share. Even doing this once a week will help. Keep your vehicle well-maintained. Inefficient vehicles pollute more and cost more to operate. Keep tires properly inflated and check them monthly. Under inflated tires increase drag and reduce gas mileage. Plan trips to combine errands. A cold engine emits more pollution and reduces efficiency by 50%. Avoid excessive idling. Avoid filling your gas tank to the very top. Spills and fumes contribute to air pollution. Refueling after dusk in the summer reduces ozone production. Start charcoal with an electric or chimney-type fire starter instead of using lighter fluid. Use an electric or hand mower on your lawn - or better yet, change to low-water use desert landscaping. Avoid using oil-based paints and solvents. Limit recreational use of fireplaces. The smoke is an irritant and contributes to urban haze. Cast your vote for cleaner air. Let your elected officials know that you support clean air initiatives. Healthy Air Is In Our Hands. State of the Air 2014 - The State of the Air 2014 report is completed by the American Lung Association and looks at levels of ozone and particle pollution found in official monitoring sites across the United States. The report uses the most current quality-assured nationwide data available for these analyses.